Preheat the oven to 200ºC/400ºF; line one large baking sheet with baking paper and brush it lightly with oil. Thaw puff pastry according to the package instructions; open it, forming a rectangle – keep the plastic wrap under it. In a small bowl, whisk the egg yolk and butter together and brush the entire pastry with the mixture (there will be some left). Sprinkle with the parmesan, the fleur de sel and pepper. 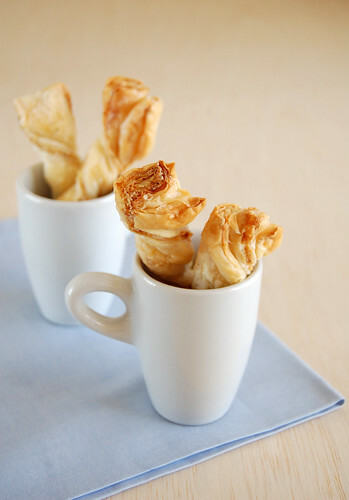 Fold the pastry in half and lightly press it to seal the filling. Using a very sharp knife or pizza wheel, cut the pastry vertically in 1.5cm (a little over ½ in) strips, then cut the strips in half (horizontally). Twist each strip pressing the ends together again to enclose the filling. Place the twists onto the prepared pan ½-in apart. I love puff pastry AND I love cheese twists! YUM! Mmm delicious, love cheese twists! I make those at Christmas and I add a little ground red pepper for some zing. They are always a hit! So pretty! These would be great for a party!! any excuse to use puff pastry is fine by me! :) your twists look perfect! This is such good timing! I've been looking for a recipe like this as I'm intending to bake cheese straws (twists) for a reception coming up in August. These look so pretty. 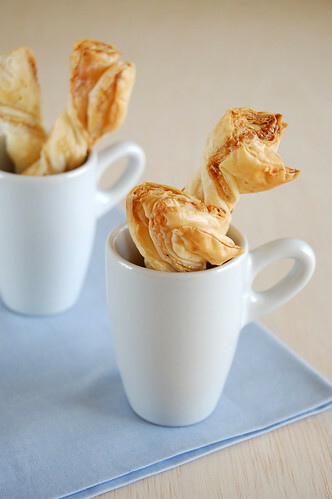 Wow thats fantastic way of using puff pastry sheets, i have some in my pantry, would love to try these! thanks for sharing! Oh, happy days - I used to love eating these as a kid. I'm sure these are a much superior version, though! is there anybody who dislikes puff pastry? - not me or anybody I have ever met. It's irresistible. I love these cheese twists. So yummy! 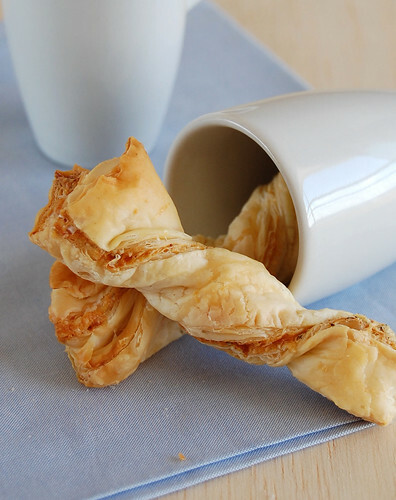 Puff pastries really are one of the world's greatest ingredients. Those look wonderful, and I always have some puff pastry in my freezer ready to go. love that middle photo, these look soooo good!! Patricia, I just found your blog and I am in love! You have such beautiful creations and lovely photographs...I'm off to enjoythe rest of your site! What a deliciously simple thing to make as an appetizer! Bookmarked! And that sounds like a great idea I'm willing to try, tks! Kelly, what a great idea! Tks for sharing! Heather, I do hope you try them! Parita, let me know what you think of them, I'd love to hear your opinion! Anita, I'm in for anything cheese. Tks for commenting! Jasmine, I'll be trying that version, darling! Tks for the lovely idea! KJ, everyone loves it! I'm glad you like the twists, darling. Tks! Lydia, that is a great ingredient to have around, don't you think? Monica, thank you for your kind words! I'm glad to know you are enjoying the blog. I'll be checking yours, too! Joey, very simple and takes no time to put together! Cheese twists are a definite favorite of mine! I can't wait to try these!